Husum WindEnergy 2012 is the venue for Baumer to present more sensor product innovations for wind power stations. Product focus is on offshore encoders. The comprehensive portfolio has been completed by new absolute encoders GM400-C and GM401-C as well as incremental GI255-C and GI356-C. All devices are compliant to corrosion category C5M. Absolute and incremental encoders operate on the all- optical principle and thus are fully immune against magnetic fields. Incremental HeavyDuty encoder HOG 86 L with fiber optic interface is the innovative solution to choose when it comes to long-distance generator feedback. Fiber optic signal transmission allows for 2200 m cable length and is absolutely insensitive against electromagnetic interference. Optionally with redundant sensing, the encoder will transmit the signals generated by two sensing units simultaneously both in an electric and optical way - for example, electric transmission to any control unit within a 500 m range and optic transmission to a more remote control room. These encoders comply with corrosion category C4. 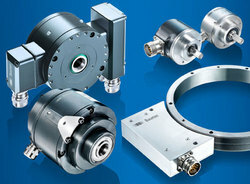 Bearingless encoders of the HDmag series further add on the Baumer wind power portfolio. They can be attached straight onto giant rotor shafts with diameters up to 740 mm and. constitute a cost-optimized solution. DNV-certified variants fully match offshore conditions. Another product innovation presented at the exhibition is the ZHDM Blade Monitoring System. Acquisition of blade strain both flapwise and edgewise enables individual pitch control and will trace any structural damage or ice accumulation early on.